Disclosure: This post is sponsored by Global Influence. While compensation will be provided for my post, all views shared are mine and mine alone. As the teams start getting weeded out, leaving only the top teams to fight it out and see who will win this year's World Cup, my family is loving all the soccer coverage on television. This is one sport my husband says that you can't record and watch later. You have to be in the moment with other spectators tuning in all around the world to watch. And, you can't help but find yourself on the edge of the couch or inching closer to the television from the floor, to see if a goal is made. And, when a goal is made, get ready to let loose, yelling and screaming Goal! Goal! Goal! You really get into the game, and feel the energy of those in the stands, and the players out on the field. Soccer really is a wonderful sport, and one worth checking out. 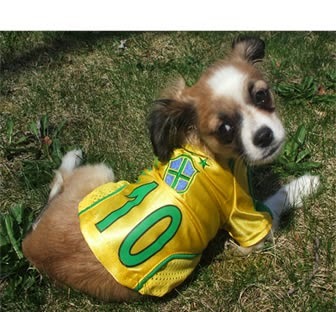 And, with the current World Cup happening now, what better time to become a soccer fan. Whether your are rooting on the USA or another country, get ready to find yourself getting excited about soccer and cheering and yelling Goal! But, also be prepared for family rivalries, like we are seeing in our house. I love rooting for the USA and Italy teams, while my husband is rooting for his home country El Salvador, along with Brazil and Argentina. We are sweating it out, watching and waiting to see which of our favorite teams will be the World Cup. The last thing you want to be doing when watching sports is sit next to someone or be the person in the room with bad BO, as a result of sweating or getting too excited about the game on the television. So, make a point to put on Degree deodorant before gathering with friends and family to watch the live soccer matches of the World Cup 2014. 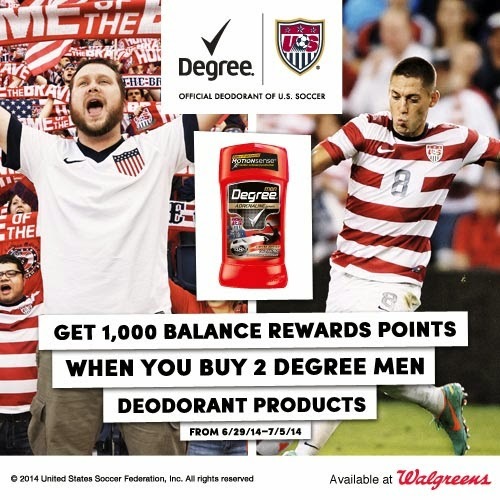 And, right now Degree is partnering with Walgreens in celebrating and cheering on U.S. Soccer. Head into to your local Walgreens between 6/29–7/5, and get 1,000 Balance Rewards points when you buy 2 Degree Men Deodorant products. This is one offer not to be missed. You know your guy loves Degree deodorant, and now you can restock his supply in time for the hot summer months when he needs it most, while also getting rewarded with 1,000 Balance Reward Points. It is a win-win for all! "So, move more, cheer more and Do:More this summer with Degree!" This past weekend, I visited my local Walgreens, and surprised my husband with the new Degree New, Improved MOTIONSENSE antiperspirant, along with his other Father's Day gifts. Degree with New, Improved MOTIONSENSE is the only antiperspirant that releases extra protection when you move, for up to 48 hours. While deodorant is not a gift one would expect, my husband loves Degree and reaches for it each morning before heading out the door, after working out at the gym or going biking, so he was happy to have more deodorant. And, I will be making a point to stop in when on 6/29, when the Degree Do:More offer at Walgreens begins, to buy more for summer odor and wetness protection for my guy. I know that if one of my husband's teams will win, he will rub it in my face that he knew from the start that "XYZ" was the best, compared with USA and Italy. But, hey, I would probably do the same. :-) Come on it is sports and everyone likes to see their team win, right? :-) I am so hoping, as are many others, though, that USA takes it this year! Go Team USA!!!! This deodorant sounds amazing I will have to pick some up thanks for sharing and hope you had a nice father's day.